flexyframe HD (Heavy Duty) is extra thick and extra wide for extra protection! flexyframe HD is a front bumper guard specifically designed to protect your car from careless parking of others. Its patented design gives flexyframe a stealthy appearance while its flexible rubber frame increases shock absorption. flexyframe front bumper protector offers the convenience of a license plate frame acting like a bumper guard. flexyframe® is a front bumper protector and license plate holder designed to protect your car from scratches, dents and dings it may get due to the careless parking of others. flexyframe®'s unique patent protects the rear bumper of the car behind you as well. US Patent #625,234 design not only covers your unsightly screws but also protect you. A metal screw can easily create rear bumper damage at the lightest touch from your car. Save yourself the headache and money. 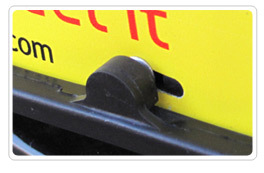 The screw caps are integrated into the frame so there are no screw caps to pop off your car like other bumper guards.